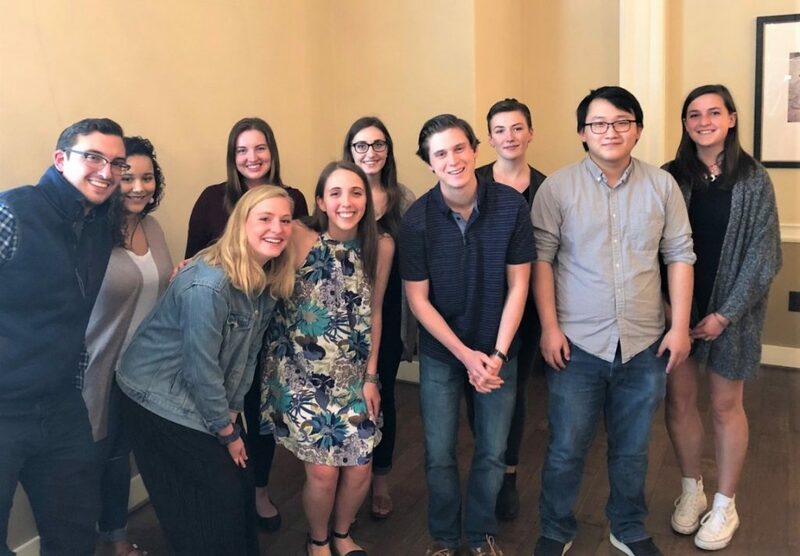 Fifteen majors, minors, and graduate students in the English department were recognized at the annual awards reception on April 25, 2018 in the Magnolia Room. Robert N. Shorter was the principal medievalist in the English department for 41 years. Professor Shorter was one of the founders of the Medieval Studies program and minor. His legacy as an exemplary professor, colleague, and mentor is what we hope to uphold in the Wake Forest Medieval and Early Modern Studies Program. The Medieval Studies Award was renamed the Robert N. Shorter Medieval Prize in 2003. H. Broadus Jones was professor and chair of English for many years. He taught Shakespeare, Romantic poetry, and Victorian poetry at Wake Forest for much of the first half of the 20th Century. The Shakespeare Prize award recipient is a student whose oral and written work shows the greatest insight into Shakespeare. The H. Broadus Jones Memorial Scholarship was set up in 1972 by his family in his memory to recognize the outstanding accomplishments of our rising senior majors. And each year a graduating senior and a Master’s student whose work exemplifies Jones’s spirit of scholarship and dedication to the study of literature are chosen to receive the H. Broadus Jones awards for Excellence in English. The late Bashir El-Beshti was for many years one of the most beloved and esteemed members of our department. He was noted for his high standards in teaching and scholarship. A fund was established in his name to recognize distinguished students who fulfilled his ideals of learning. Alonzo “Al” Kenion taught at Wake Forest University from 1956 until 1983. He taught courses in 18th-century English literature and was a frequent teacher in our Interdisciplinary Honors program. The award is given to a student excelling in an English course formerly taught by Professor Kenion. The late D.A. Brown was a member of the English department for many years. He was noted for his high standards, and on his retirement, a fund was established to recognize excellence in writing. The Creative Writing program began offering awards in his honor in 2016 to students who show talent in the art of creative writing. The Bynum G. Shaw Prize in Journalism honors Bynum Shaw, a 1948 Wake alumnus and professor of journalism. At his retirement in 1993, friends, colleagues, and former students contributed to a fund to endow a graduation prize in his name. They wanted to memorialize a man who encouraged his students to think of themselves as writers and to try to publish inside and outside the college community. This award is named in honor of Beulah Lassiter Raynor, who taught in the English department from 1946 to 1979. The award has been endowed by her friends and former students, and recognizes outstanding rising senior majors from small towns in North Carolina. Emily Crandall Shaw and her husband Bynam Shaw, who was a professor of Journalism at Wake Forest, were Wake Forest alumni. After Mrs. Shaw’s death, Mr. Shaw set up this scholarship in her memory to recognize outstanding rising senior English majors who show talent in arts as well as in literary study. Justus Drake was a professor of English at Wake Forest for a number of years. He taught American and Victorian literature. His wife Elizabeth was the administrative assistant to President Scales. The Drakes’ sons were Wake Forest alums, and they set up this scholarship in their parents’ memory to recognize the outstanding accomplishments of our rising senior majors.